Fly ash is also called coal ash, it is widely used in many fields. However, the wide application of fly ash also increases the risk of environmental pollution. The common pollution contains groundwater contamination and air pollution. Therefore, it is important to find a good way to store it to prevent environmental pollution. 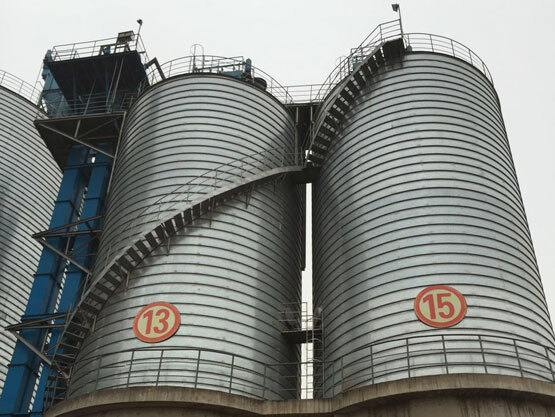 Steel silos are one of the best choices for fly ash storage, and we can provide you many models of high quality ones. In a typical fly ash processing system, the material generated by combustion is captured by an electrostatic precipitator (ESP) or a baghouse before the flue gases reach the stack. These ESPs and baghouses usually have multiple pyramidal hoppers at the bottom, in which the ash is collected by gravity and then is transferred to the fly ash storage silo. These fly ash storage silos generally have provisions for a truck load-out to carry the fly ash for disposal or reuse. As a result of the frictional nature and fine particle size distribution, fly ash processing systems often encounter problems if they are designed without a prudent engineering method. Fortunately, fly ash storage silos can solve these problems well. Expertise in offering right silo for right material storage and transfer needs. Supplying silos with complete structural support steel and access platforms. Professionally engineered with the lowest cost. Meeting customers’ requirements for outstanding performance and convenient structural accessibility. 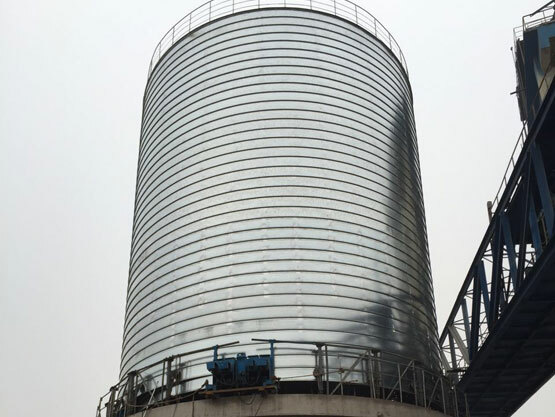 How To Clean Fly Ash Silo? First of all, in the construction site of fly ash silo, you should set up temporary warning signs to warn that no irrelevant person should ever enter the construction site. Seal the pipe where fly ash comes into the silo, and tie the wire up, set warning signs. When there's no fly ash in the silo, the downstream equipment such as the bottom of the base should be put into the maintenance position. Library lighting lamps should be placed into the fly ash silo from the hole in the middle of the top, the cleaning staff should not be exposed to lighting tools and lines. In the fly ash silo cleaning process, the number of people outside the silo should be twice the number of people in it. And professional staff should be sent to monitor outside the fly ash silo. After the safety of base stacking and the ladder’s stability have been confirmed, you can enter the silo. 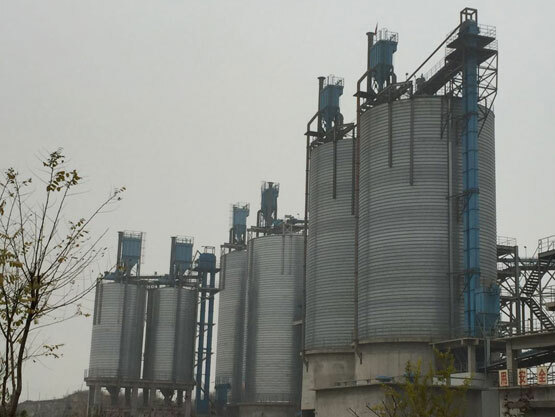 To enter the fly ash silo, the construction workers should wear labor protective equipment first, including anti-dust masks, goggles, safety shoes, and safety helmets. When entering the fly ash silo, the workers have to fasten two safety ropes, one fixed in the library outside the dust collection device support, the other fixed on the ladder. When the cleaning starts, the feed rate of the mill should be based on the flow; if the flow is too small, put ash in the upper part of the rotor balance pipe, and put down the fly ash mixed with the mixed material to do the mixture. The iron bars and compressed air are used to poke the fly ash to the bottom of the pool, and then blow out the compressed air at the top of the silo; after the compressed air is blown out, the long stick is used to stick the fly ash, and last, use shovel and pick to put it into the silo. Please notice: people should beware of the falling material and keep distance from them at the beginning. If you need high-altitude operation in the fly ash warehouse, you should strictly abide by the relevant provisions of high-altitude operations. It is prohibited to use explosives to clean up the fly ash silo. When the process of coal ash silo cleaning is finished after the completion of a thorough clean-up, the cleaning work can be over. Fly ash, also known as coal ash or "pulverized fuel ash" in the United Kingdom, is one of the coal combustion products, composed of the fine particles that are driven out of the boiler with the flue gases. Ash that falls in the bottom of the boiler is called bottom ash. It is a general name used for the residual products of combustion that rise with flue gases. Chemically and physically, fly ash can have many forms, these depend on the type of fuel combustion and treatment methods. Typical fly ash contains a significant amount of silicon dioxide and calcium oxide, which make it frictional and abrasive. Usually, fly ash has a fine particle size distribution with most less than 100 microns. Given the fine particle size, frictional nature and high temperature, fly ash can be a material hard to handle. In modern coal-fired power plants, fly ash is generally captured by electrostatic precipitators or other particle filtration equipment before the flue gases reach the chimneys. Together with bottom ash removed from the bottom of the boiler, it is known as coal ash. Concrete Production: Used as the replacement for Portland cement in concrete because of its pozzolanic properties. Embankment and other road constructions like road sub base. Grout and Flowable fill production. Agricultural uses: soil amendment, fertilizer, cattle feeders, soil stabilization in stock feed yards, and agricultural stakes. Loose application on rivers to melt ice or roads and parking lots for ice control, etc. Copyright © Anyang Flyer Steel Silo Engineering Co., Ltd. 2017 All rights reserved.